I’ve been falling behind on Processing Month, but it’s not because I haven’t been hacking away, it’s because I’ve been hitting a lot of walls, not having things work out the way I want them to. I’m trying to not just take other people’s code and go from there, but trying my best to dig through the Processing documentation and reference and figure things out. Sometimes it works… Sometimes it doesn’t. So that “138″ you see above is not very exciting at all. I started working with pulling data from the web into Processing, with the thought that I’ll have a web application output data, that Processing pulls in, and then talks to an Arduino to do… something. 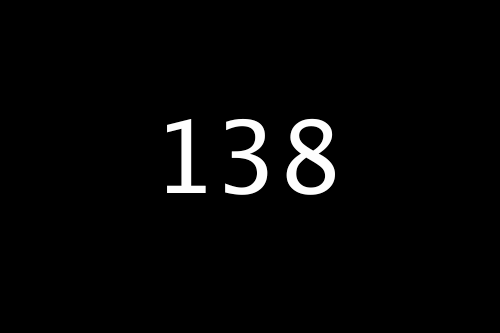 And in draw() after we call the println command, we also call the text command which puts the “138″ on the canvas. The good news is, since I have been busy with Processing (and if all goes well) I’ll have a new interactive art piece to display at the Milwaukee Makerspace for Bay View Gallery Night. Posted on Wednesday, May 18th, 2011 at 12:00 pm. Subscribe to the comments feed. Both comments and pings are currently closed. Post on your own blog.